Ever felt so mad at some driver in the middle of the road who suddenly decided to merge with the rest of the vehicles on the road? There may have been times that you may have expressed your displeasure at this person and you may even think that this annoying driver is the reason for the chaos in traffic but research suggests otherwise. And now you’re probably wondering who in the world would even have conducted such research? Well, it was the Kansas Department of Transportation who conducted the research and the results say that these kind of drivers are actually doing it right. Shocked? So were we!! So according to the Kansas Department of Transportation, if all the drivers on the road were to adopt this strategy, then there would be less of chaos on the roads. As per the research conducted, it says that everyone should use the “zipper method” when merging. Why everybody ought to utilize this technique is that it will make everybody, not simply you, get on your way much faster. See below what happens when people actually follow the “zipper method”. 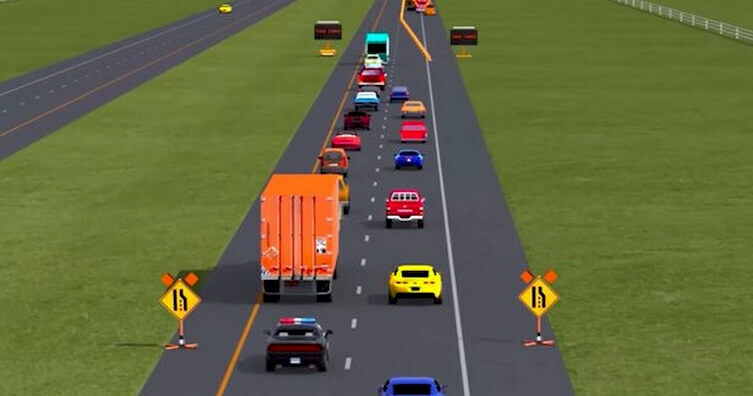 All of the vehicles in the merging lane should move up almost as far as they can and then move into the next lane between other vehicles evenly. At the point when merging happens in the zipper design, the activity on both sides doesn’t need to stop, which is the real drawback of vehicles converging at indiscriminate spots. The research also suggests that if everyone started going the zipper method, traffic could move ahead 35% faster. I would consider that a real incentive to use the “zipper method”, wouldn’t you? Share this technique with your friends.